For the fourth consecutive year, the capital welcomes the Christmas Fairyland. This year, "Paramythoupoli Xristougennon" appears more refreshed than ever with modern, impressive games that will amaze young and old. Like every year, Santa will leave Rovaniemi for a while and will visit his friends in Lefkosia with his assistants and many many Christmas presents. Dozens of little houses with all sorts of delicacies from all over the world will fill Paramithoupoli again, while this year's activities are more impressive than ever: Stilts, balloons, jugglers, theatre play, acrobatics and dance shows! In addition, every visitor will enter a lottery for a brand new car that is looking for his lucky driver and will meet him after the big finale. The most popular artists will entertain us and will be celebrating the Christmas season with us. 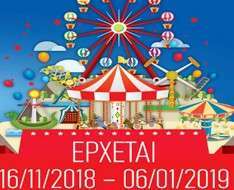 Paramythoupoli Xristougennon 2018 opens its doors on Friday, November 16, while the official opening will take place on Friday, November 23, with an impressive concert with the explosive Greek singer Eleni Foureira.